The PiravomValiyapally is the Head Church of, 11 chapels and 11 "Kurishinthottikal"(Cross-sites). There are annual celebrations and Holy mass on scheduled Sundays in these chapels. The very oldest chapel is that in the seminary complex. Piravom Seminary Chapel Tower "
Kakkad North " Kadavil "
Kakkad Middle " Arch gate "
Kakkad Thottabhagam " Thandika "
Kakkadmadathil " Pazhoor Padathu "
(Pazhoor - Peppathy Side) Chathurakkallu "
Pazhoor Y.M.C.A " Karroor "
The seminary estate was purchased by the Piravom Church before one century, for the purpose of an institution (seminary) for the training of the clergy. H.G. Paulose Mar Koorilose, H.G. Paulose Mar Philixinos, Ougen Mar Timotheos, Thomas Mar Osthathios and Philipose Mar Ivanious, used the seminary bungalow as the Bishop’s palace. There are seven Sunday schools working under the Piravom Church and its Chapels. There are Classes from 1 to 12. It helps to produce a good posterity for both the church and the society. The J.S.V.B.S held at the church during every April, co-ordinating all Sunday Schools, is the biggest V.B.S Centre in Malankara. Teachers’ seminars and X’mas Carols are also held every year. The Piravom church has ever and always stood together under the holy throne of Antioch. Many radical powers have tried to make problems here. But the true faith protection council (samithi) has tirelessly worked to retain the parishioners in the true faith. The part played by this council in the church is commendable, the more that the parishioners are steadfast to the principles and faith. 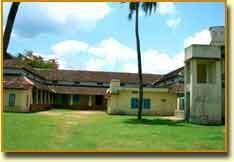 The Youth Association is an active religious organization working in the Piravom church. It co-ordinates and leads the youth for charity works. It does great service to the society through the medical treatment aid project, the relief aid project and the social welfare aid project. The Association takes initiative in conducting eye testing camps, blood testing camps and to form the blood bank. The Association organizes meetings on every Saturday for evangelization in the church, and on alternate Saturdays in chapels. The association distributes uniforms and study aids to the poor students. The top mark holders and their schools in S.S.L.C / J.S.S.L.C on the parish level, Sunday school level and Panchayath level are honoured by giving them awards. The youth association does praiseworthy service during the Denaha, and Easter celebrations to maintain discipline among the multitudes. The Association publishes "Youth Voice" - a magazine - to propagate the news of the Church (Sabha), Parish and also the gospel. Church have 20 kudumba units - more details – after……. St.Thomas pazhoor y m c a. The MarthMariyamVanithaSamajam is an active organisation in the Church. Its members assemble on every Sunday in the church. They take initiative in preaching, charity works and voluntary service. Its active presence is clear in the meditation meetings on every Saturday. St. Mary’s daycare centre and play school function under this Samajam at Piravom. The Church has a very active role in evangelization; besides meditation meetings are held on every Saturday afternoon, at the church, and also at the chapels of the Church as noted above. There are also prayer meetings at the houses of the parishioners on every Sunday. Moreover prayer and Retreat meetings are held during the days of "Holy Week" and "EttuNombu". The spiritual enlightmentprogrammes are also active in the church. The church choir is formed to beautify the prayers and to make them melodious. With modern musical instruments the choir joins the congregation and makes the prayers more attractive and thus makes the H.Kurbana pious and more devotional. It sings devotional and spiritual songs in gospel meetings, during wedding ceremonies and on other special occasions. The Church is in the forefront of social activities. Many Govt. Offices function in the church building, like as SBT Branch, Sub-registrar Office, Veterinary Hospital, Irrigation Office, Agricultural Office etc. The school auditorium is used for social and cultural programmes. The newly constructed parish hall is a grand asset to the entire community. There is the active presence of the church in almost all social and development programmes held at Piravom. The Ambulance service of the church is available round the clock for the benefit of the people.